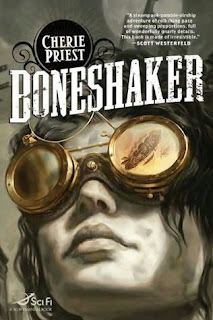 Cherie Priest's steampunk sci-fi novel "Boneshaker" is coming to the bigscreen with Cross Creek Pictures, Exclusive Media Group and Hammer Films onboard. The companies said Wednesday that Hammer has acquired the rights to the novel. Project will be co-produced by Hammer and Cross Creek Pictures and co-financed by Exclusive and Cross Creek. John Hilary Shepherd ("Nurse Jackie") is writing the screenplay. Hammer head of production Tobin Armbrust is overseeing. Priest's novel is set in an alternate version of 1880s Seattle, where the city has been walled in and a toxic gas has turned many of its remaining residents into "Rotters," more commonly known as zombies. A young widow hunts for her teen son in the Seattle underworld while dealing with airship pirates, a criminal overlord and heavily armed refugees. The novel, published in 2009 by Tor Books, is the first in a series set in the period, which has Priest has dubbed the Clockwork Century. Second novel "Dreadnought" was published in 2010, and the third, "Ganymede," was recently released. Tor Books is releasing the fourth in the series, "Inexplicables," in 2012, and last week announced a deal with Priest for her to write a fifth. That book will be called "Fiddlehead." "It's like Jules Verne meets 'Resident Evil,' and we're thrilled to have such a fun, commercial potential franchise in Boneshaker," said Cross Creek's Brian Oliver. I've read all of the Clockwork Century books to date and they have a strong cinematic quality so cross your figures that Boneshaker goes from option to green-lighted quickly.